As far as seasonal decor goes, I'm Team Minimal. It's not that I don't like having a festive house, but I'm not the kind of gal to go around putting ceramic turkeys in every room. (If that's your jam, you do you! I just prefer items that blend a little more with my everyday pieces.) My favorite ways to jazz things up for fall are to use pumpkins and woodland tones, so I focused on that here. I was expecting the gilded pumpkin place cards to be my siren song today, but I'm really loving the wood slice wreath. The "I'm thankful for" placemats are handy, too, because I always seem to forget one or two things on my list as everybody goes around the table. All of these qualify for the seasonal decor trifecta: festive, simple, and easy to store. A couple of things like the place cards and placemats could even go home with your guests, so that's less to worry about keeping around for another year. I'm a member of Team Minimal when it comes to fall decor too, and I'm loving everything Paige picked out. Paper feathers, you are so invited to Thanksgiving Dinner this year. In addition to writing for Bubby and Bean as our Home Contributor, Paige works as an Interior Designer (check out her biz, The Room Kit) and blogs over at Little Nostalgia. You can also find her on Facebook, Twitter, Pinterest, and Instagram. I love all of your picks, and giving them to your guests after dinner to take home is a great idea! I love that wood wreath! Love it. Great finds. I'm also into minimal and easy-to-store. 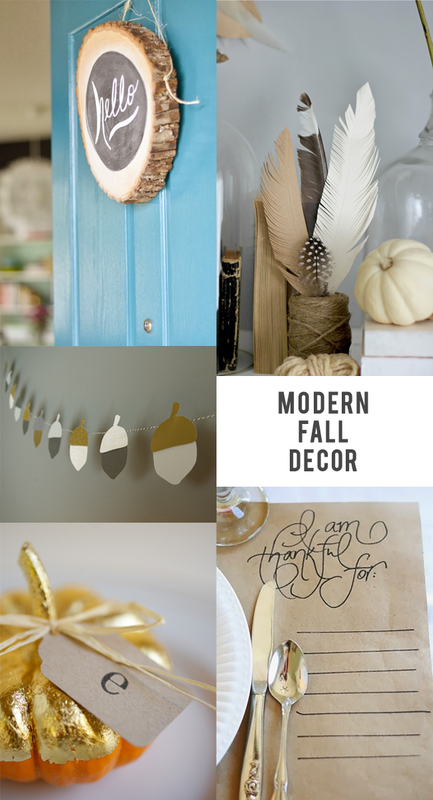 My favorite is the placemat - but I also love that Hello wooden wreath. I'm with you...minimalist when it comes to season/holiday decor. I love those paper feathers and the tree slice! These would be great all year long! When it comes to holiday decor, I'm on team minimal, too - not neccessarily for lack of desire to decorate but because of a lack of space. Where do people store all of those certamic hearts/jack-o-lanterns/turkeys/santas? That's what I want to know! Thanksgiving has already passed here in Canada but I'm filing away the I'm thankful for placement idea ofr next year, it's so lovely and clever, too!